A Pesante family food blog to share recipies and our quest to create delicious, fresh, & sustainable cuisine. Sundays are very busy for us, so when we get home from church we are hungry! We like to have something that is fast and delicious, so today we made some Mesquite Chicken Sliders with a mixed veggie slaw, a recipe inspired by Teenie Cakes food blog. We also got a chance to use some veggies from our sample basket from Outstanding In Our Field CSA, we used the kohlrabi, purple cabbage & white cabbage. I love that they just picked this for us yesterday afternoon! We could certainly taste the quality and freshness from this sustainably grown produce. Thanks Erin and John! Preheat grill or pan. Place chicken breasts in zipped plastic bag and remove air. With a meat mallet, pound chicken to 1/2-inch thick. Remove chicken from the bag and coat with olive oil and rub your mesquite seasoning on both sides. If your cooking fast and hot, cook chicken for 2 minutes and each side and check for doneness. If using a lower temp, adjust accordingly. Let stand for at least 10 minutes. Using a large bowl, combine yogurt, vinegar, mustard & sugar, season to taste with salt and pepper. 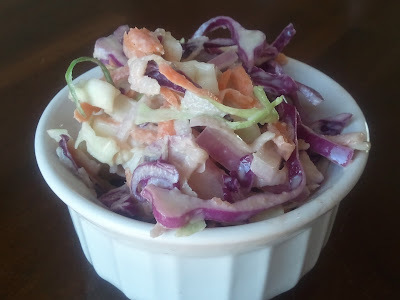 Add carrots, cabbage, kohlrabi and red onion and mix in the yogurt mixture well. Taste and season again with salt and pepper to desired flavor. Refrigerate before using. Cut chicken to fit buns. 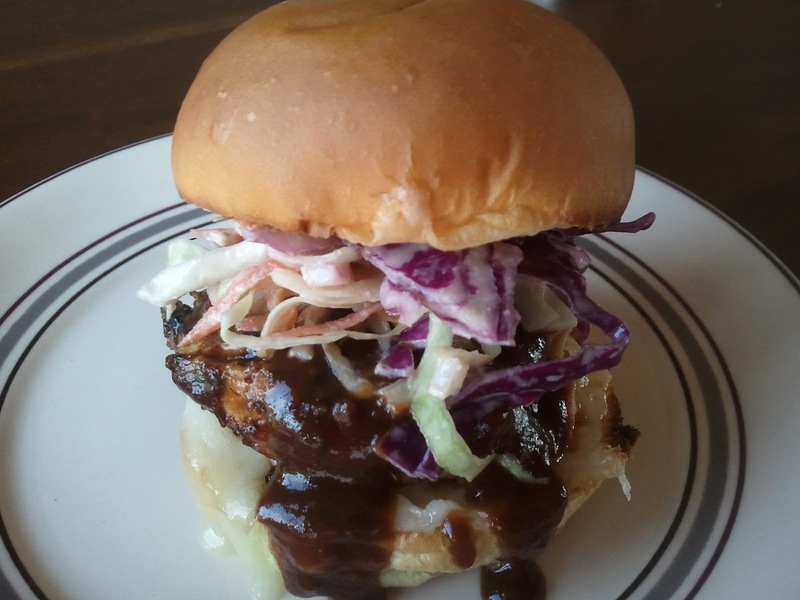 Place chicken in bun, drizzle with BBQ sauce and top the chicken with a generous amount of slaw. My friend Matt @ Thyme In Our Kitchen had the house to himself a couple of weeks ago, so I politely invited myself over to cook : ) I suggested that we make fish tacos and Matt's first thought was Mahi Mahi. We teamed up and combined some fresh ingredients to make these delicious tacos. 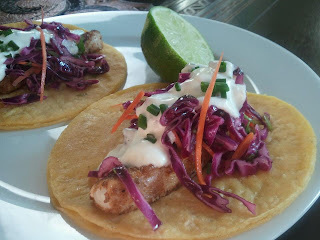 I was in charge of the toppings so I made a zesty red cabbage slaw with some lime sauce while Matt prepared the fish. I must say that I'm proud of those toppings! 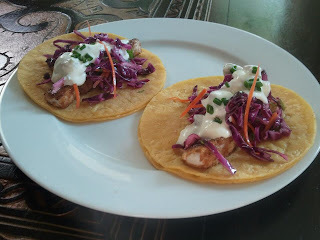 I found a few fish taco recipes on the web and used ideas from a few of them to create my own. I love to cook with other people and I look forward to doing this more often. I miss the days of cooking with my good friend Peter; I may have to get him in the mix next time, he has fantastic flavors to contribute! Pat the filets dry and slice each one into long sections, about 3/4-1 inch wide. Season generously on all sides with cajun seasoning. Heat olive oil in a large pan over medium high heat. Add the fish and cook on each side 1-2 minutes or until just barely cooked through and fish starts to flake. Remove from pan and drain on paper towels. Our first blog post is a family favorite. This Angel Hair Carbonara is one of those staple dishes that we have at least once a month. 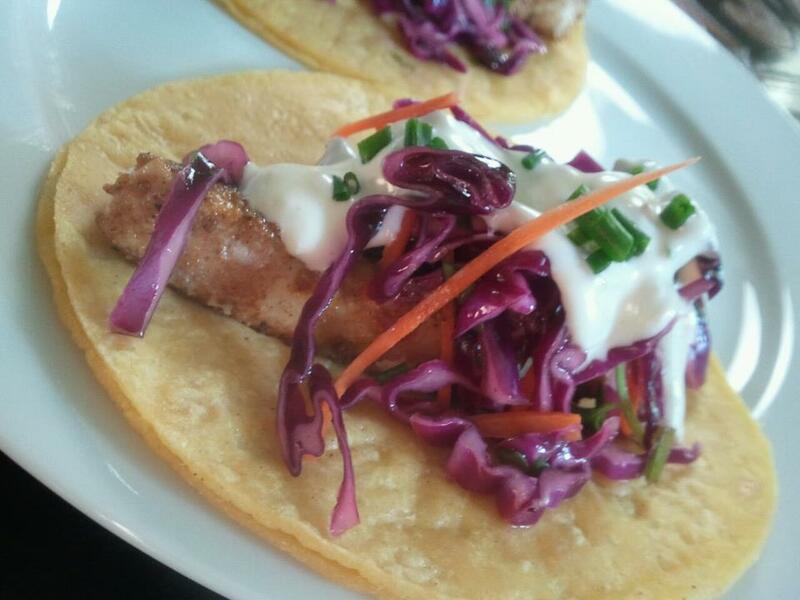 We love simple, fresh & sustainable meals that we can prepare quickly. When I got home today all of the ingredients were prepared so we could toss them in together. We love using fresh and organic cherry tomatoes, green onion, mushrooms, garlic, free-range eggs, and our killer organic bacon that we got when we purchased a quarter pig a few months ago. Fresh grated Parmesan cheese, to taste. Start a large pot of generously salted water to boil for pasta. I use a large palm full of kosher salt in a full stock-pot. Slice bacon strips into lardon sized slices. Place in cold pan (I use an ungreased cast-iron skillet) and render til bacon is crispy. Use a slotted spoon to remove the bacon and drain on paper towels. Pour out bacon grease, but reserve to saute mushrooms, onions and garlic. Over medium heat saute the mushrooms and 2/3 of the green onions, adding only enough bacon fat to keep veggies from sticking to pan. When veggies have softened add the minced garlic and deglaze with the white wine. Saute just until garlic begins to soften but not brown. Cook angel hair (or whetever pasta you choose) according to "al dente" package instructions. Place sauteed veggie mixture in the bottom of a large serving bowl. Use pasta spoon to transfer cooked pasta to the serving bowl, to reserve the hot, starchy pasta water in case you need to thin your carbonara. Allow the pasta to cool only slightly(as not to scramble your eggs). Next, pour the beaten eggs over the hot pasta and veggies and quicky toss to coat everything evenly. If it is tough to toss or becomes heavy and dense add a small ladle full of hot pasta water until it loosens and becomes easier to mix. Add in the raw tomatoes, remaining 1/3 green onions and the crisped bacon and gently toss the whole affair to incorporate all the ingredients. Add as much parmesan as you like and enjoy! This is a great recipe to change up each time you make it. I often will make it with frozen peas or fresh spinach. It's also delicious if you grill red onions, asparagus and tomatoes and toss those in! Pesante Cuisine. Awesome Inc. theme. Theme images by kcline. Powered by Blogger.